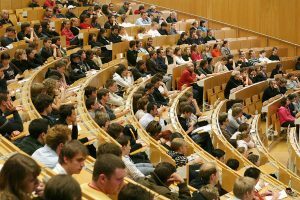 The Chair of Entrepreneurship of the University of Kaiserslautern offers an Entrepreneurship-Lecture Series in cooperation with the founding office Kaiserslautern. Invited are those interested in founding, students, employees of companies and all others who are interested in entrepreneurship. The Chair wants to arouse enthusiasm for entrepreneurship, develop entrepreneurial skills and strengthen the start-up climate in Kaiserslautern. Just like last year, Lucas Pulkert (CEO of fashion brand „von Jungfeld“) and I were invited to give a lecture about Brand Building & Sales Strategy for Start-ups – also, just like last year, we had more than 80 interested students listening to and discussing with us!